Top Line has been supplying high quality stainless steel products to the dairy, food, beverage, pharmaceutical and other process industries for over twenty-five years. Our commitment to fine craftsmanship, responsible service and realistic pricing has led to our company’s successive years of growth. 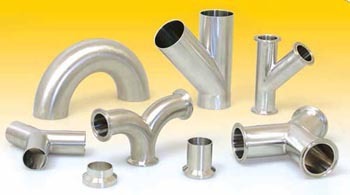 Top Line specializes in stainless steel materials–types 304 and 316L. Our modern, well equipped manufacturing facilities are staffed by skilled and dedicated craftsmen. Consistently meeting important tolerances and finish specification is of primary concern to us. Before any products leave our plant they are subjected to rigid quality assurance checks. Top Line should always be considered your first choice for both standard and custom fabricated stainless steel products. Click below for further details. John Perry Fittings are found primarily in the Dairy and Beverage markets and differ from a Bevel Seat Fitting in the respect that the John Perry ferrule is a “flat face” while a Bevel Seat Ferrule has a beveled face. Our John Perry Fittings meet or exceed 3-A standards and are either machined or polished to a 180 grit finish on the ID and 25 Ra and 150 grit finish on the OD. Each product is marked with the alloy, size, and heat number so you can be supplied with full trace ability. Top Line is your source for John Perry Fittings which meet or exceed FDA and 3A regulatory standards.